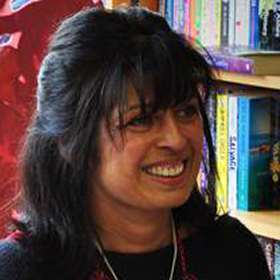 Sita Brahmachari is an award winning author of over ten novels, short stories and plays (Published by Macmillan Children’s Books, Barrington Stoke , Otter Barry Books and Bloomsbury.) Creative projects with diverse communities are at the heart of Sita’s writing. She has been Writer in Residence for The Book Trust and Islington Centre for Refugees and Migrants and is an Amnesty International Ambassador championing the right of young people. She is currently under commission to Orion for two further novels . Sita received UK Honour 2018 for Tender Earth from The International Board of Books for Young People.